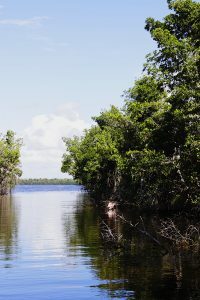 FLORIDA CITY, Fla.- As a senior in college with no concrete plans of staying in South Florida post-graduation, I knew my chances of going to Everglades National Park were quickly disappearing. It’s somewhere I’ve always wanted to go, but I never knew how to plan my trip. When I finally got the courage to try, I started simple. I typed in “Everglades” into the map app on my phone and was surprised to find that it was only one hour and 45 minutes away from my Coral Gables apartment. Little did I know, there are three different areas of the Everglades. After doing more research, I decided to go to the closest part of the park, about 45 minutes away, just past Florida City, and southwest of Coral Gables. I texted as many friends as I could think of and told them my plan, finally convincing one of them to come with me. 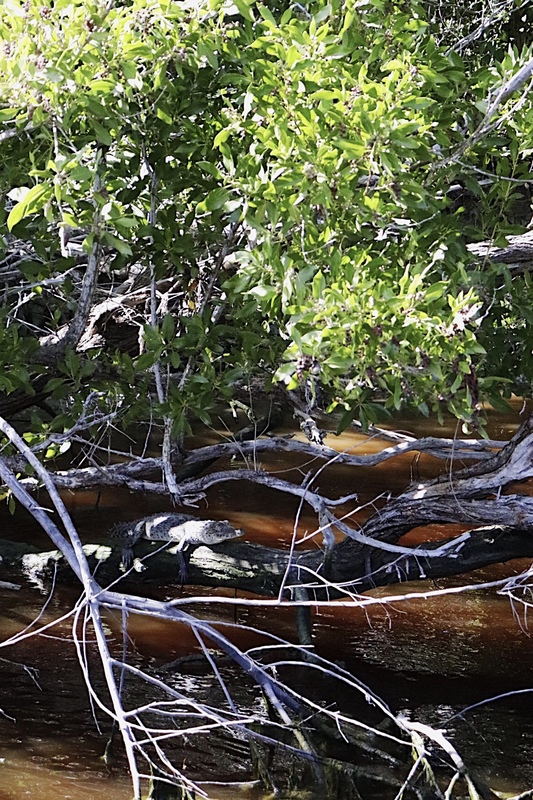 A baby crocodile sits on a tree in Coot Bay, one of the only areas in the Everglades that is inhabited by both alligators and crocodiles (Photos by Julia Kohl). The next step was packing my backpack. I plugged in my camera battery and started to make a list of what I needed for the next day. Sunscreen, bug spray, sunglasses, a hat, Chapstick, a portable charger, multiple bottles of water and snacks all made the list. We planned to go on a Sunday, so we decided to sleep in and leave at 10:45 a.m. because the traffic would be light. When I woke up, I put on my hiking clothes and made myself a decent sized breakfast. After unplugging my camera battery and double checking my list and backpack, I headed to my car. I drove to campus to pick up my friend, Hayley Tesser, a sophomore at the University of Miami. We stopped for gas before heading onto the highway. I followed my GPS, which wanted me to take the Florida Turnpike. After 35 minutes, we exited the Florida Turnpike Extension. Even though it was almost lunch time, we weren’t hungry enough to stop for food. We did, however, pass Robert Is Here Fruit Stand and Farm, for which we were given recommendations. The quaint shop is famous for its outstanding fruit milkshakes, so we vowed to get them on our way home from the Everglades. From that point on, we followed the big signs directing us the Everglades, but we kept the GPS on for backup. Our first stop was the Ernest F. Coe Visitor Center, which offers information, exhibits, retail items and restrooms. “Can I help you?” a young man asked from behind the desk as we walked in. Not knowing anything about what to do on our trip, we took him up on his offer. “I recommend starting at the other end of Park Road, it’s one long road all the way down to the end. That’s where Flamingo is. You can do a boat tour, which starts at 1 p.m., or go canoeing or kayaking. It takes around an hour to get down there though, so you better get going if you want to make the 1 p.m. boat ride,” said Matt. I looked at the time on my phone, it was 12 p.m. We quickly asked about what else to do while we were there, and he told us the lengths of all the trails. He also warned us to stay at least 15 feet away from any crocodile or alligator we might see during our trip. We took his advice and jumped back in the car to head to the Flamingo Visitor Center, where we could buy our tickets and board the boat. With not one car in sight, it took around 45 minutes to drive the 38 miles to get there. We parked, got our backpacks ready and headed to the visitor center. We bought our tickets, applied our sunscreen and bug spray and found a nice shady spot on the boat. Twelve others filled the remaining spots on the boat. The group consisted of people from across the country and also from across the world. “I’m here from Paris,” one visitor said, while others started to shout out where they’re from. “I’m from Australia,” said another. 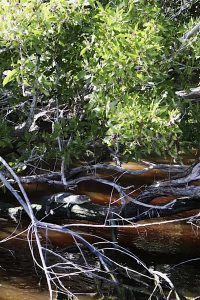 The slow-moving boat took us through the mangrove estuaries that filled the waters of Coot Bay and Tarpon Creek, all the way to Whitewater Bay. It’s the only part of the Everglades that has fresh and salt water, so we were able to see crocodiles and alligators during our boat ride. While we didn’t see as many as I had hoped, we got a great view of a baby crocodile and a huge adult crocodile, and saw a few heads pop up from five other crocodiles and alligators. Cassie Johnson, a park naturalist, educated us during the boat tour on everything we were seeing. She talked about the different kinds of mangrove trees, birds and how to know if you’re looking at an alligator or a crocodile. The excursion lasted about an hour and a half. I definitely recommend going on the boat tour if you visit this part of the Everglades, it was a great way to see the diverse ecosystem and different animals that the park has while also enjoying the shade. Make sure to stop at the restrooms before heading to the next stop because bathrooms are limited through the trails. “I want to stay for the sunset at 6:30, but I don’t think we will make it until then,” said Hayley. It was 2:30 when we got off the boat and we decided to leave the park around 5. We pulled out our map to plan our remaining two and a half hours. The closest trail was West Lake, followed by Mahogany Hammock, Pa-hay-okee Overlook, Pinelands, then Royal Palm. We drove 15 minutes and stopped at a small pond before heading to Pa-hay-okee Overlook. I stepped out of the car and reapplied my sunscreen as the Florida sun radiated onto my shoulders. 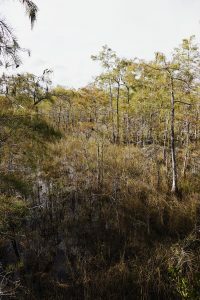 Tall, dry trees surround the two-tenths of a mile Pa-hay-okee Overlook path. The 10-minute trail was filled with breathtaking views of muted green and brown fields. Although it was a short trail, only 0.2 miles, we took our time, taking in every bit of nature as we walked the path. Once we were done, we got back in the car to head to our next and final stop, Royal Palm. “Want a snack?” said Hayley as she pulled out a granola bar. I told her I was okay and could wait for our milkshakes. After another 30 minutes of driving, we finally arrived at Royal Palm, which has two different paths. We decided to do the Anhinga Trail first. This had to be my favorite trail, I couldn’t take my eyes off of the still water covered in bright and deep green lily pads. 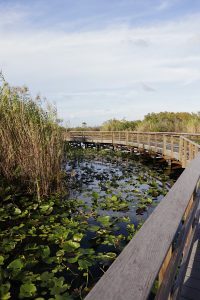 The scenic pathway was filled with reptiles and insects; snakes, lizards and grasshoppers slithered, crawled and jumped their way down the path along with park goers. The trail took 25 minutes to complete, then we walked towards the Gumbo Limbo Trail. Before even stepping foot on the pathway, Hayley and I noticed how different this side of the park was. A canopy of trees protected our skin from the strong sun but the air was static. After walking along the trail for five minutes, we decided to turn around. While mosquitoes and other pesky insects weren’t an issue throughout the other parts of the park, I could feel the bug’s microscopic legs landing all over my sticky body, getting swatted away before they had a chance to bite. Lily pads float on water that surrounds the pathway of Anhinga Trail, one of the two trails located at Royal Palm. Once we got back to the car, morale was beginning to fall and we knew we needed a little pick me up before our drive home. My body slammed down onto the driver’s seat as I searched my bag for water. After chugging my last bottle, I put the car in reverse, backed out of my parking spot, and headed toward the main road. There was only one way in, so we figured there was only one way out. I let my battery recharge instead of turning on the GPS. Before making our way to the Turnpike, we stopped at Robert Is Here. The store was filled with fruits, jams and alligator jerky. I ordered a strawberry milkshake to refuel me for the drive home. With one hand on the wheel and the milkshake in my other, I couldn’t help but think about all of the different views and animals I had seen during my trip. It was crazy to consider all the nature and wildlife that lives just 45 minutes away from a major U.S. city, populated with hundreds of thousands of people that haven’t gone to experience all that the Everglades National Park has to offer. If I did it all over again, I would do it the same way. I got to experience so much in such a small amount of time, and I was fully prepared with everything I had packed the night before. The only thing I would do different, is that I would stop for a milkshake both on my way in and out of the Everglades, because I haven’t stopped thinking about that fresh strawberry milkshake since.